What Is The Mormon Battalion Trek? 1846-1847 Mormon Battalion’s route – from Iowa to California. Our living history re-enactors will dress and live like original Battalion members telling their story as we move from one campsite to the next. 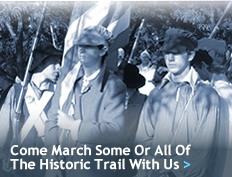 If you want to accompany us, check out our Come March With Us pages. For those who can’t hike along, we will provide “virtual” Internet updates. Track Us While We Trek! Track the Battalion Trek reenactors as they follow the footsteps of the 1846 Mormon Battalion. Our location updates every ten minutes using SPOT® - The Satellite Personal Tracker. To track our progress LIVE click here. © Battalion Trek, LLC. All rights reserved. Site developed by eVision Communications.